SeaMonkey, a new browser project under the Mozilla.org umbrella is available in version 1.0 alpha. The goal of SeaMonkey is to provide that traditional browser suite. Ten years ago, at the dawning of the Internet as a mass participation phenomenon, there was Netscape Communicator, the overwhelmingly most popular choice in Internet software. Communicator included a browser (Navigator), an email client (Messenger), and an HTML authoring module (Composer), thus enabling users to do most of their Internet-related work in one application. Then Microsoft Internet Explorer came on the scene and shifted the dominant paradigm to single-purpose applications. Explorer was only a browser, and for email you could use Microsoft Outlook Express. Web authoring required another application, and so on. This motif suited me fine. I was (and remain) a Eudora email fan, so I never really used the Messenger module in Netscape anyway, and I preferred Claris Home Page or a good HTML-savvy text editor for Web authoring. However, many Netscape users liked the all-in-one approach, which Netscape Communicator has stuck with to this day. Netscape is no longer being developed for the Mac, but Mozilla.org, which was formed in the late 1990s to develop Netscape 5, finally released Netscape 6 to the public. Mozilla.org have also offered a suite browser called Mozilla that incorporated the classic Netscape multi-module motif, but with a cleaner, interface and fewer commercial bells and whistles. In the early 00s, Mozilla began developing a new browser called Firefox, which adopted the Internet Explorer single-purpose application motif. Also available was a companion, freestanding email client called Thunderbird. Firefox and Thunderbird were supposed to replace the Mozilla suite, but the latter continues to be available in version 1.7.x, and it still receives updates - but perhaps not for too much longer. Internet suite fans need not worry. A new browser project under the Mozilla.org umbrella is working on keeping a suite available - the SeaMonkey suite. 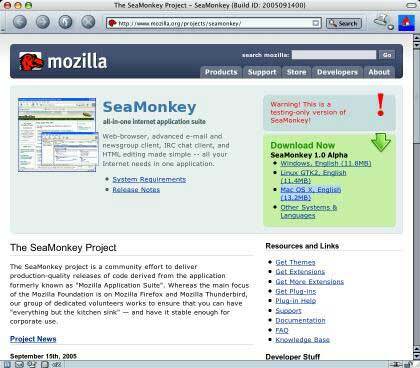 The SeaMonkey project is a community effort to deliver production-quality releases of code derived from the application formerly known as "Mozilla Application Suite". Their first public preview alpha version became available in late September. At this SeaMonkey point looks almost exactly like Mozilla 1.7, as well as including a Netscape Communicator style email client, a WYSIWYG web page composer, and an IRC chat application. But underneath the hood much of the core code is shared with the Firefox 1.5 Beta browser. While the SeaMonkey 1.0 preview is alpha software, I've been using it for most of my workaday browsing for more than a month, and have found it to be just as stable as Firefox. It may not be quite as fast (there is probably some optimization left to do), but it's not much slower, and it has the solid, competent feel users have come to expect from Mozilla browsers. If you are a fan of Mozilla or classic Netscape, you'll feel right at home in SeaMonkey. I'm delighted that the SeaMonkey team has chosen to continue offering a Mac OS X version in their development plans. There seems to be in small trend back toward suite browsers, with Opera recently adding email, newsreader, and instant messaging clients with Opera 8.x. The downside of that of course is size, SeaMonkey is a pretty big download at 13.2 MB. As a browser, I find SeaMonkey very pleasant to use. Like the other Mozilla Gecko-based browsers (except for Camino), it doesn't support OS X Services and doesn't have Opera's wonderful "resume last session" feature. Aside from that, it does pretty well everything most of us need a browser to do, and it does it well. One thing I especially like about SeaMonkey is that it starts up really quickly - perhaps the fastest-starting OS X browser currently available. SeaMonkey 1.0 Alpha does not presently include official SeaMonkey artwork, as the SeaMonkey project is still open to logo submissions from its community. The new logo will be selected from these community and integrated into the upcoming SeaMonkey 1.0 Beta, which will be the last version before SeaMonkey 1.0 ships later this year. I did not check out the mail and HTML authoring modules other than to open them for a quick look, but I anticipate that if you are a user of Netscape/Mozilla Mail and/or Composer, you will feel right at home in SeaMonkey's version of those programs.